Mr. Vinik and his cronies have bought their way onto the November ballot spending over a HALF a MILLION DOLLARS to collect petitions to qualify a referendum for increasing the sales tax in Hillsborough county to 8% - the highest in the state. All because he needs light rail to make his downtown [Under] Water Street real estate go. Vinik then somehow "leap froged" in line right over the Hillsborough County School District to have a state mandated audit of the programs receiving the $15 billion tax plan. The school board had already informed the state that they were going to put a 1/2 percent sales tax question before the voters in November. The school district wanted their tax hike for much needed A/C replacements, capital improvements and hardening of the schools for security. I do not know how Vinik did his leap frog but I bet there are thousands of teachers, parents and students who do want to know. Vinik was even able to "fast track" his audit request to get OPPAGA to get his audit done in record time before the September 7th deadline. A performance audit is a thorough examination of your operations, performed in accordance with Generally Accepted Government Auditing Standards, also known as Yellow Book standards. How does any performance audit of a complex $15-18 BILLION spending plan across multiple spending programs in multiple agencies get done in a few weeks? 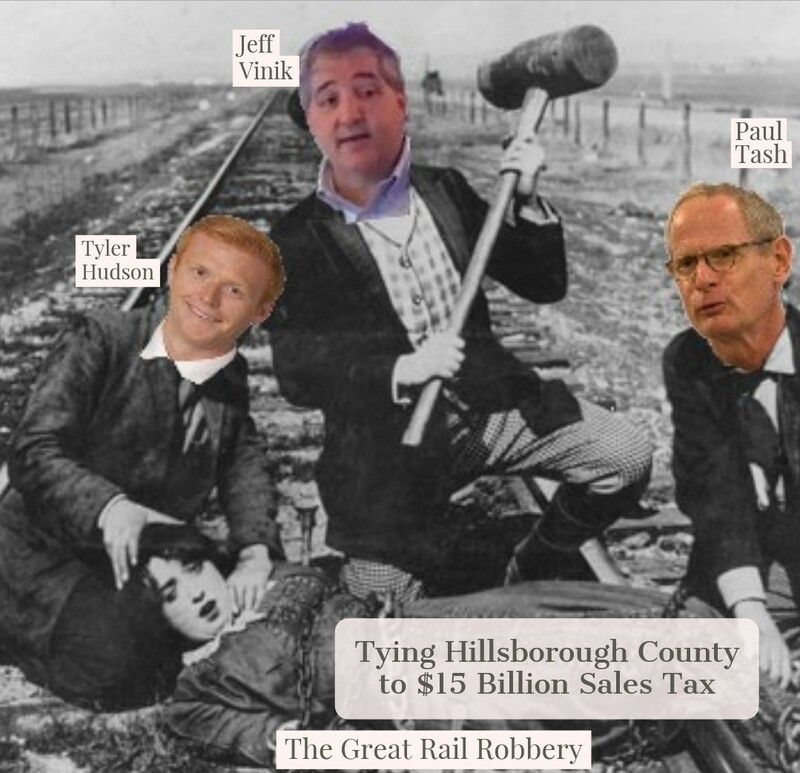 Vinik's rail cartel he lined up to ensure his tax hike gets on the ballot is not just bad, but oh so greedy! I have expected such an ill conceived plan to defraud the people of Hillsborough out of $15 billion for their own purpose, but to step over children, teachers and putting their safety at risk was I thought a step too far even for them. To Vinik and his deep pocketed allies pushing this tax, providing the funding to support the tax hike effort is just business hardball. It has more to do with their bottom line then anyone getting to work on time - which their plan will never do. The lies have already started and began the very moment they started collecting petitions. The lying continues in the press and is told to anyone who will listen. Vinik's rail cartel even have lied to state reps and senators. 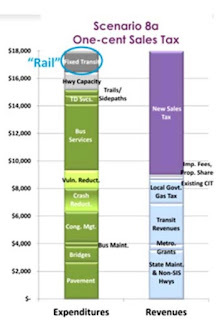 That is the MPO's 2040 Long Range Transportation Plan 1 cent tax hike funding scenario that contains billions of dollars in Rail Construction. The modeling scenario is based on costly rail. 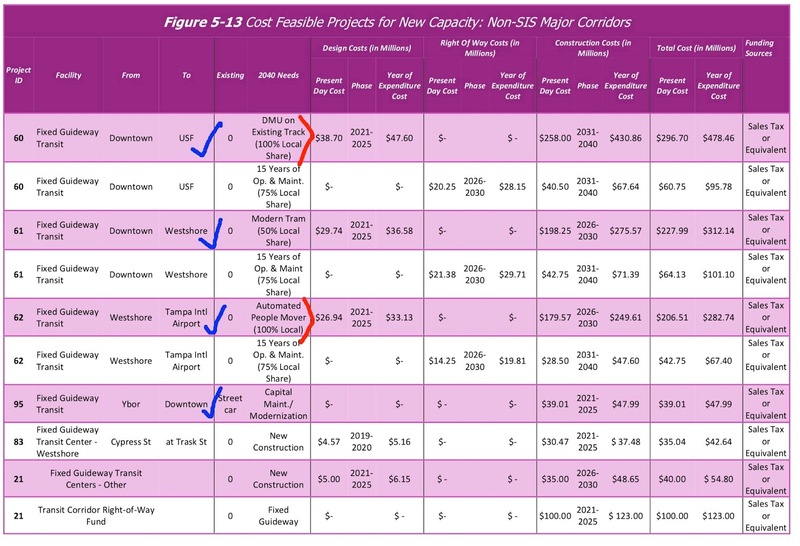 Vinik's plan actually sets aside more for rail than the MPO did. The fact that the plan contains rail was confirmed by Tampa Bay Times reporter Christopher O'Donnell when he interviewed me Wednesday to get my take on the petition qualifying. Not only did he confirm there was rail in the plan but that there will be enough money so they don't have to get money from the "feds or state" to build it. 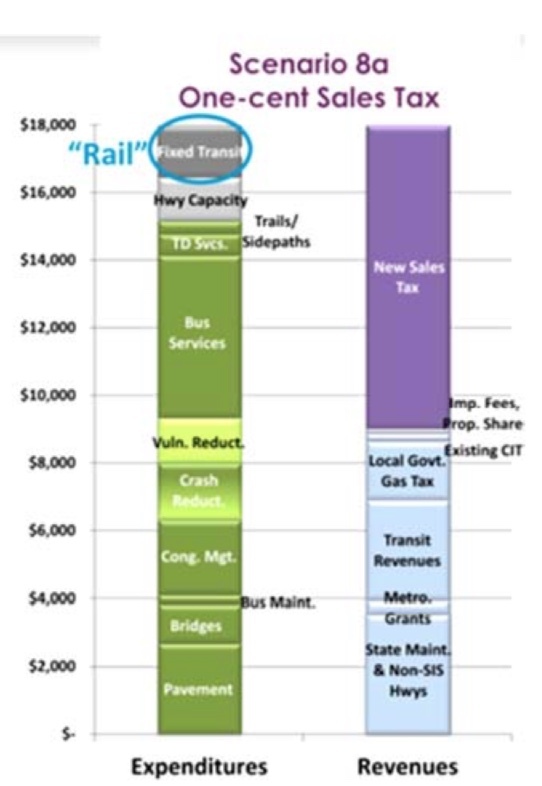 Hillsborough MPO's LRTP funding scenario for a one percent sales tax hike. The MPO even highlights RAIL. 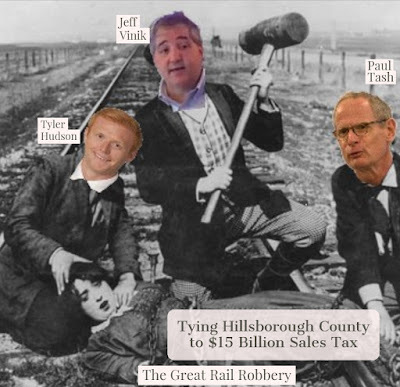 Vinik's massive tax hike forces taxpayers in Hillsborough County, the vast majority of those taxpayers live in unincorporated Hillsborough, to pay for 100% of the capital costs for the downtown Tampa cronies trains. The burdensome regulations were intentionally built into the petition language by Vinik and his downtown allies. The backers of Vinik's tax hike plan know the plan can never qualify for federal funds. The recent regional premium transit plan facilitated by HART clearly stated that and the FTA gave the plan (which is essentially unchanged from 1996 - it simply keeps getting recycled) a poor rating in 2005 making it ineligible for funds. The 2014 AECom report transit assessment stated the ridership and densities do not exist in Hillsborough to qualify for FTA federal funding. Nor is there any value capture money in the petition plan which makes now receiving federal money nearly impossible. But so was leapfrogging the school board…. The question now is "can Mr. Vinik, Mr. Sykes, Tyler Hudson and all the other downtown elite with their media megaphones and PR firms in tow BUY the Election". Can the downtown Tampa cronies take $15 billion, most of it from the people in unincorporated Hillsborough County, and enrich themselves? They will let nothing stand in their way including the truth because this is just business. It is literally a train robbery. Supporters of Vinik's tax hike plan, which includes the Vinik owned Tampa Bay Times, refuses to report how much the sales tax will take from local taxpayers over 30 years. They only reported the revenue raised in the first year - $280 million. Using the same growth rate as the MPO's LRTP, Vinik's massive tax hike will take at least $15 BILLION out of local taxpayers pockets over 30 years. The supporters of Vinik's tax hike plan will never print or say the word RAIL because they know it is toxic and have been instructed not to. The public will never see my alternative transportation funding plan that uses revenue numbers actually vetted by the county and that the county commissioners took unanimous action on. Local media refuses to report about my transportation funding plan that could provide the same or better congestion relief, fund the MPO's LRTP, build sidewalks and trails, improve safety and decrease vulnerability BUT NOT RAISE YOUR TAX. The local media blackout of my plan was confirmed by Mr. O'Donnell Wednesday. The Times reporter stated they will not print my alternative plan because "it is not news worthy". I have lived in New Tampa for 25 years. I co-founded and was president of the New Tampa Transportation Task Force and represented the city of Tampa on the Transportation Committee of 99. I have served on the county Citizens Advisory Committee, the Indigent County Healthcare Board and the Emergency Medical Planning Council. I have been involved with local transportation efforts for over 20 years and recently assisted in the county's $600 million 10 year transportation program financed by annual increasing ad valorem revenues. My funding plan renews the CIT tax for fire/rescue and police and gives the Hillsborough School Board the opportunity to be successful in their sales tax initiative. But such plan is not "news worthy" according to the Vinik owned Times. Supporters of Vinik's tax hike will also not tell you how much of the money will be paid by the taxpayers in various areas of Hillsborough county nor that 51-53% of the revenue will be spent within the city of Tampa which contains only 27% of the population. They will not talk about how regressive the sales tax is or how it is going to gentrify and displace the very people they say they want to help. So let the lying begin - again. We will be here to expose them. If supporters of the Vinik massive tax hike are so sure about their plan and so pure in their self-described purpose, then let's have a debate on the merits of both plans so voters can make an informed decision. It's time for a debate between myself and Tyler Hudson, the Chair of the Vinik funded All for Transportation PAC who got this tax hike on the ballot. Will they agree? We doubt it. They have too much to hide. They can't afford to have a debate because lying is already expensive enough and they are going to find out just how much - $5 million or more over the next 89 days until the November election. But remember this is just business to Vinik and his cronies and they will probably just write it off as another expense. The rail tax hike war has officially begun!